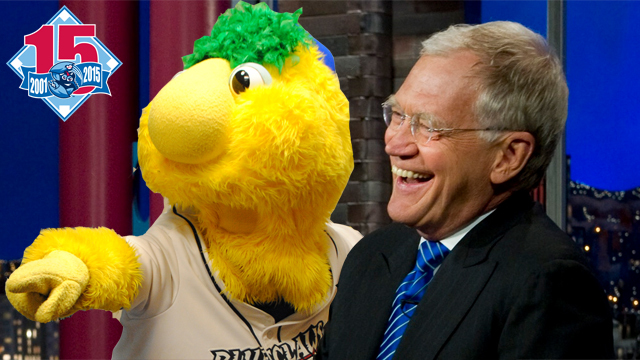 LAKEWOOD, NJ - A television icon is set to retire, and the BlueClaws will honor the career of David Letterman at their game on Friday, May 22nd. PLEASE NOTE: The BlueClaws, due to a rainout on Thursday, will play a double-header on Friday night that starts at 5:05. Gates will open at 4:30 pm. The night is officially "David Letterman Night" at FirstEnergy Park, and will feature a full tribute to the outgoing late-night tv host. Tickets: Tickets for the game are currently on sale by calling 732-901-7000 option 2 or online by clicking here. The night will include: Stuipd Pet Tricks, several Top Ten lists (such as the Top Ten Ways to Indentify a BlueClaws Fan), video clips on the BlueClaws new video board, a desk, representing Dave's Ed Sullivan Theater desk, will be on the concourse as the Information Booth, and much more. BlueClaws fans have been writing Letters to Letterman at recent games which have been sent in to the retiring Late Show host. Additional promotions and elements of David Letterman Night at FirstEnergy Park will be announced as the game date approaches. 10. We had no other good ideas. 9. We wanted to do more Top Ten Lists. 8. Something to talk about besides deflated footballs. 7. One of our ushers went to Ball State...Go Cardinals! 6. Stupid Pet Tricks between innings. 5. He is retiring...not that complicated folks! 3. If Derek Jeter was honored in 30 major league ballpark, Letterman deserves one minor league ballpark. 2. It's Buster's favorite show. The Friday, May 22nd game will also include post-game fireworks courtesy of Woodhaven Lumber.